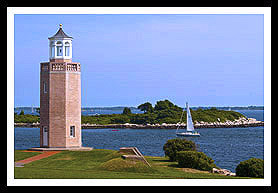 The lighthouses were built in Southeast Connecticut to accommodate the increasing traffic for the fishing and whaling industries in guiding mariners around the rocky ledges of Fisher’s Island into New London’s frequently foggy harbor, and around the dangerous ledges at the entrance to that harbor, into Stonington Harbor, and traffic entering the Mystic River. Note: The lighthouses mentioned below that you can drive to can also be viewed from various boat tours offered, see Boat Tours below. Connecticut is rich in history. In New London, the Coast Guard Academy Museum contains artifacts spanning over two hundred years of history of America' maritime service. For family fun, visit Ocean Beach Park, with its beaches, and miniature golf course. Take the Essex Steam Train and Riverboat Ride pulled by an authentic steam locomotive. At Steamboat dock, the Connecticut River Museum, exhibits a replica of the Turtle, America's first"'submarine", built in 1775. 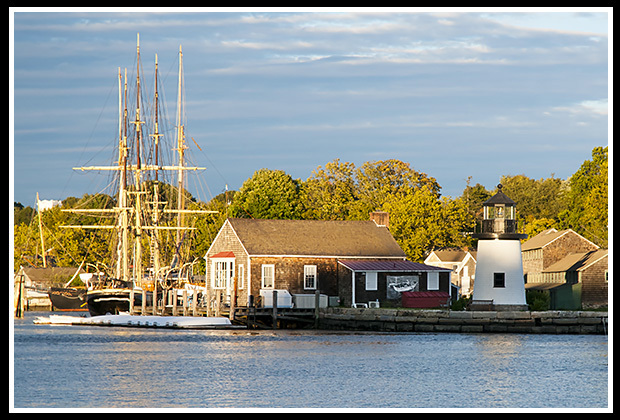 Mystic Seaport is a recreated 19th century village with a maritime museum, a working preservation shipyard, and four National Historic Landmark vessels. 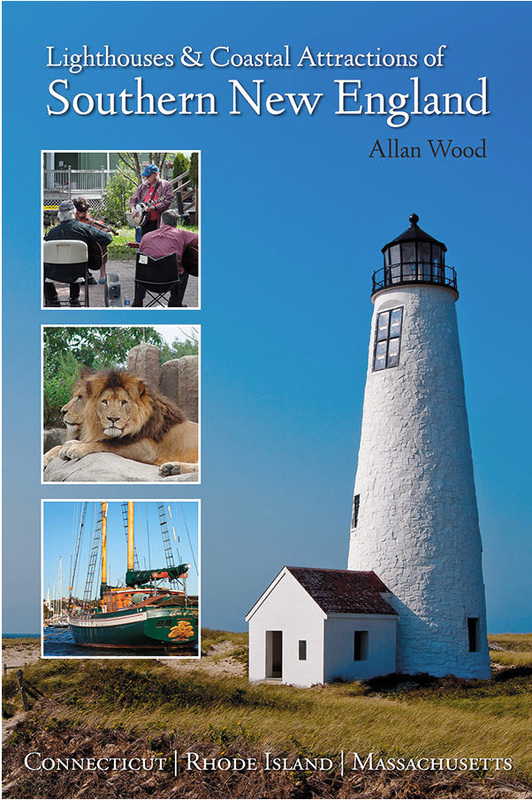 These include the world's only functional whaling ship, the Charles W. Morgan, and a coal fired wooden steamboat, the Sabino which you can take along the river and get close views of New London Ledge lighthouse. 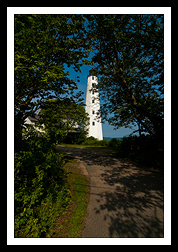 You'll also find a full sized replica of a New England lighthouse constructed familiar to Brant Point light on Nantucket Island in Massachusetts. This is where you can explore, learn, and fully experience our New England maritime heritage, as those who've sailed these vessels many years ago. To learn more about this special museum, visit the Mystic Seaport blog site or check out this video about the volunteers who make this place happen. The Mystic Aquarium nearby provides many exhibits of all kinds of marine life. In Groton, visit the U.S. Navy Submarine Force Museum, which houses the Nautilus, the first nuclear powered submarine. 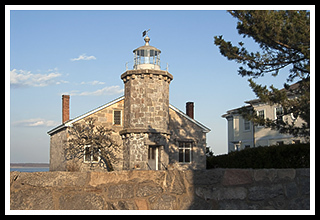 Stonington is rich in historic architecture from the 18th to the 19th centuries. 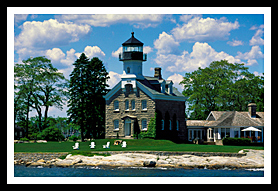 Stonington Harbor lighthouse is now part of the Old Lighthouse Museum owned by the Stonington Historical Society. Stonington is also part of the Connecticut Wine Trail, which showcases 19 of Connecticut's wineries. 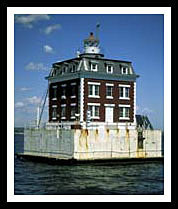 Tour of New London Harbor which includes a walking tour up to the lighthouse tower.